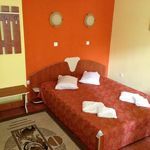 Rooms, services Vila Uranus Eforie Nord is offering 20 tastefully furnished rooms to those seeking accommodation in Eforie Nord. If neccessary, you may park your car at the parking place of the villa for free. Even during the hottest summer days the temperature is pleasant, thanks to air-conditioners being in operation in some of the rooms (you can make sure on the information sheet of each room if it features air-conditioning). Wireless Internet connection (WiFi) is available at the villa, enabling portable devices and smartphones to go online. If you wish to learn more about the exact scope of services provided by Vila Uranus Eforie Nord (including any available for an extra fee) or about the equipment of the rooms, you will find them on the information sheet below and on the information sheet of the selected room. Payment The villa is offering the following methods to pay your reservation: cash, bank transfer. Arrival, opening hours The earliest arrival time is 14:00, the latest time to leave the rooms is 10:00. The personnel of the hotel can speak in English, Romanian, Italian and German with you. Reserve your accommodation and Vila Uranus Eforie Nord will directly send the confirmation in 1 workday. The rating of Vila Uranus Eforie Nord is 8.8 from the maximum 10, 9 based on actual and valid guest ratings and reviews.